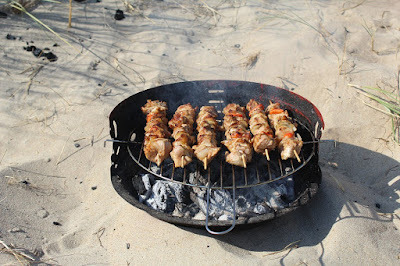 The next morning, we got up early to soak in some beach delight before the sun got oppressive and we, tanned. I am, for one, very anxious about not getting tanned. Beach lovers can tch-tch me but probably that's why I prefer the mountains to the sea. Of course I am not blind to nature's beauty and can appreciate the gorgeous sand and water when I visit one. Just that I cannot stand the patchy-skin once back home. I applied sunscreen liberally on myself and Rand then the three of us set off to have some fun-time on the sands. The beach was literally a hop-skip and jump distance from our hotel. The golden silk-like sands kissed and hugged our feet even as the clear clean waters swept them away. The early morning rays penetrated deep into the waters (and into our skin) causing them (the water I mean) to shine like silver. R loved the water and squealed in delight each time the waves splashed on the shores soaking him wet. 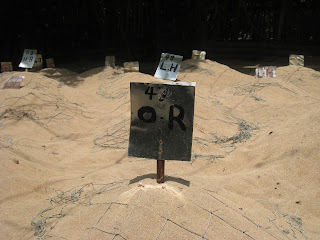 There wasn't much sand area, we noticed, as the sea-side restaurants and Inns had eaten much into the space spreading their lounge area well into the sandy beaches. At every spot we felt like we were infringing upon some property, so we decided to stroll along the long beach-line playing along with the waters as they licked our feet. After spending a little more than an hour on the beach, we gave in to our growling tummies and came back to our hotel, showered and sat down to eat a modest English breakfast of toast, butter, jam and tea. Technically, it was the last day of our tour although we were to spend a good half of the next day in Colombo as our flight was scheduled in the evening. Mr. Shirley had his hands full with his next assignment beginning with a tourist group from Australia arriving that evening itself. He was to take our leave that evening while we were to be ferried to the airport the next evening by a different driver. 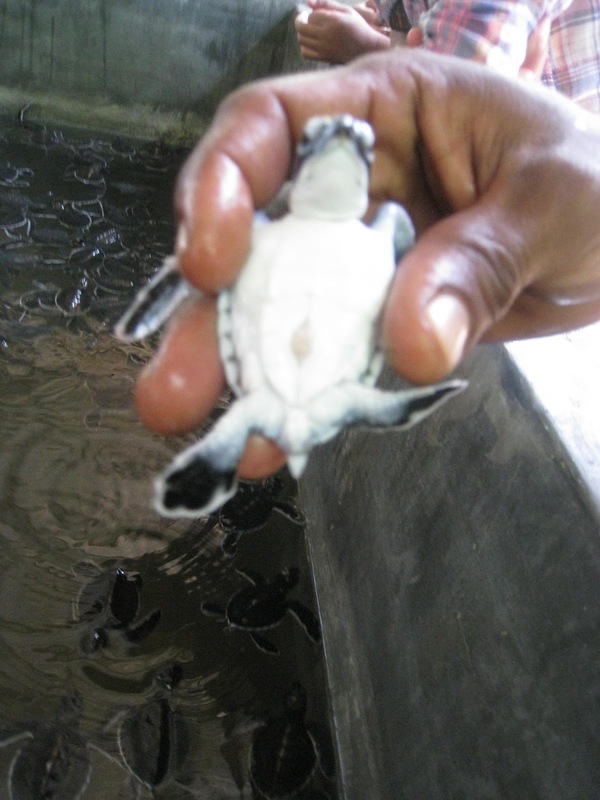 But not before we checked off the rest of our tour itinerary that included a trip to a turtle hatching farm and a city tour of Colombo. 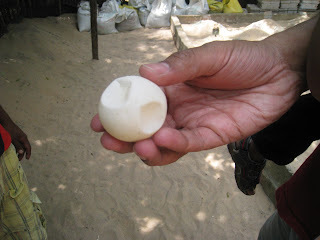 We left for Mt.Lavinia, a suburb near Colombo after breakfast stopping en route at a turtle hatching farm in Kosgoda. There are many hatching farms around these beaches. 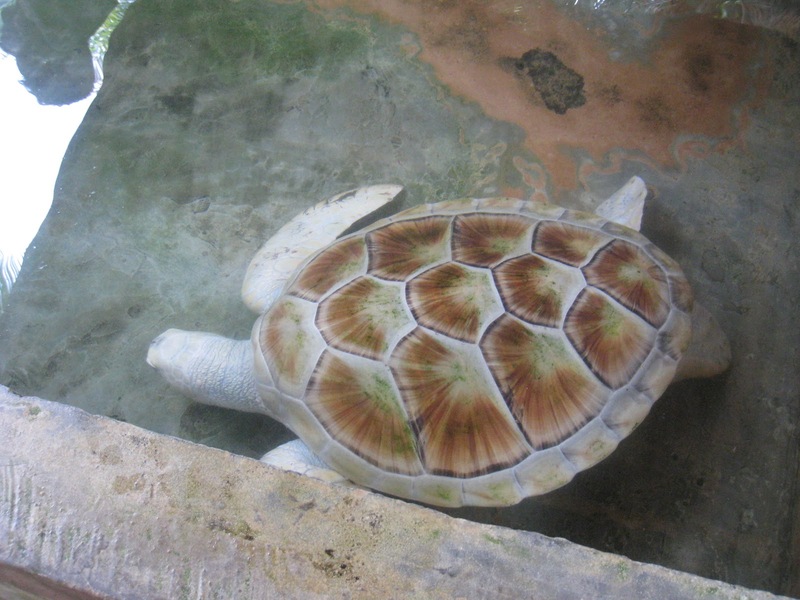 The turtle farm we went to is an endeavour started and run by some volunteers to save young turtles being eaten away by the larger sea animals and humans alike even before they hatch or as new born babies. The farm collects the eggs laid at night and hatches them at a secluded place, transfers them onto water tanks once they are hatched and then releases them out into the sea once they are a little older (a few days to couple of weeks old depending on the type of turtle). 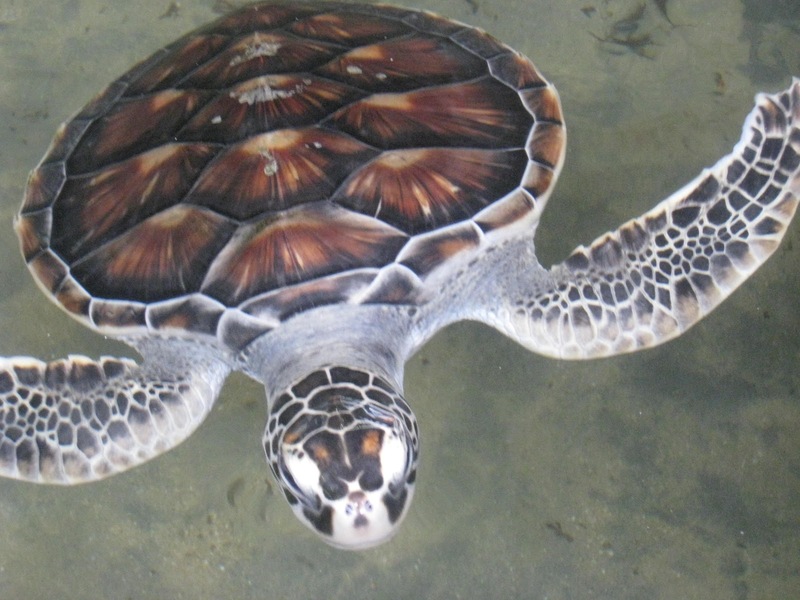 I learnt about some of the species of turtles like the Olive Ridley, Green Turtle (common around these areas of Kosgoda), Leatherback Turtle and Hawksbill Turtle. 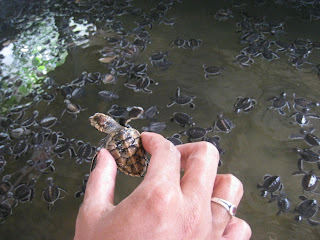 We got to hold the baby turtles in our hands. I was reluctant and apprehensive about holding one but soon gave in into the excitement levels of the husband and R. The necks of the turtle are extremely soft, much in contrast to their shell. The turtles are placed in different tanks depending upon their stage of growth, type and needs. Every tank is sponsored and supported by some foreign nationals. We even saw a rare albino turtle and a few handicapped ones (it saddened me to see these). 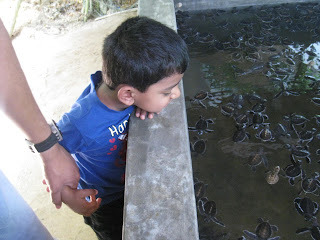 R thoroughly enjoyed his tete a tete with the turtles and had to be dragged out after the tour. 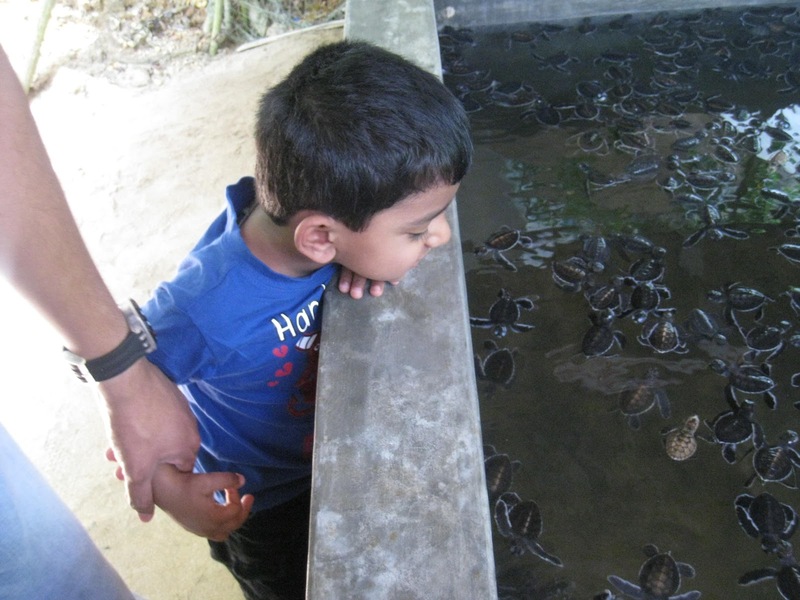 He threw up a tantrum and demanded to have the turtles and was even ready to be left with the caretakers of the place! We arrived at lunch time to the final destination of this tour, Mt. Lavinia. Knowing how much we were starved of eating familiar Indian food, Mr. Shirley took us to a typical Indian joint that served the usual idly, dosa along with the regular south Indian meals variety. Post lunch, we were taken on a quick tour around the popular areas of Colombo. Colombo was the first major city we visited in the entire trip. Although the mall culture is yet to touch SL, we saw a lot of multi-storeyed shopping centres, finally satisfying my curiosity about the presence of any big buildings at all in SL :-) Not only that, being the commercial capital, it is the hub for major companies and banks. We saw the erstwhile parliamentary house, the world trade centre and a Taj group of hotels that were situated over looking the sea, very reminiscent of the Worli Sea face in Mumbai. They even have a similar name for the area- Galle face. The colonial buildings and roads further reminded me of the fort area of Mumbai again.We bid adieu to Mr.Shirley in the evening, took tips from him about the shops where one could shop for clothes (SL is famous for cheap branded clothes, we had heard). He encouraged us to roam about more around the area in the metered autos, called Tuk-Tuk there. He ensured us about the safety and reliability of exploring thus. So, we slated the visit to the National museum for the next morning, aiming to dig around for some cheap clothes for the rest of the evening. Pictures of Colombo to follow in the next and concluding part. yes, Roopz..they were a cute sight. Look at those little turtles!!! They are so cute! 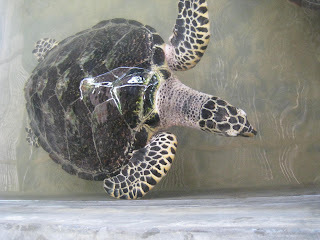 You make me want to go to a turtle farm. A very well written post, Uma. Wow you held a turtle Uma.. I don't think i would be so "brave" - and I'm not joking :) !! I was just imagining a human in the albino's shoes and somehow felt pained by its status.